The continued popularity of Three Days Grace and Breaking Benjamin is honestly baffling. Of the stale bunch of US radio rock bands, they definitely aren’t the worst, but even outside of those who are widespread fans of the genre, those two in particular continue to build traction. Even amongst angsty teenagers, downtuned post-grunge and nu-metal aren’t exactly the go-to staples. Their streak of resuscitating the radio hard rock format in 2017 seems to be continuing with Starset, but at least their progression is noticeable, implementing strings and electronics into their sound and gaining a reputation for dressing as astronauts for their live shows as an homage to frontman Dustin Bates’ love of space and science. Even with this in mind, the fanbase they’ve cultivated is surprisingly loyal, especially following their 2014 debut Transmissions. Three years later, its follow-up Vessels should produce no adverse reactions from said fanbase, and honestly, you can kind of see why that would be the case. As well as being largely more of the same as their debut, Vessels feels like a more diverse alternative to more standard radio rock, placed somewhere between Shinedown and latter-day Linkin Park or even Pendulum. As such, the ongoing sci-fi plot is narrated through suitably grandiose means, with colossal swathes of strings and pounding electronics that back Bates’ huge vocal power. Big, sweeping momentum is what Starset do best at, and the results of sticking to that are particularly cohesive. But while their corruption of typical hard rock ideals into something more synthetic removes the sort of pitfalls their peers face, it also unearths some new ones, of which Starset do tend to fall into. It’s largely down to the sound itself and how it’s foundationally built on sonic excess; as well as this whole album clocking in at a seventy minute runtime, every track attempts to cram in the additional synths, strings and programming alongside the standard rock band setup, and there just isn’t enough space for everything, leading to a situation like that at the back end of Back To The Earth, where every sound collides together and nothing can be made out. The emphasis is clearly put on the synthetic side too, thrusting it right to the front of the mix before dousing it in production gloss. It leaves any guitars either crushed into a tinny buzz or sidelined to the point of inaudibility like on the closing duo Telepathic and Everglow, and when everything is as heavy and full force as it is, it becomes an endurance test more than anything. And given that Vessels clocks in at over an hour, a front-to-back listen can be a real ordeal for anyone going in blind. At least the songs themselves are up to scratch, and while they can be seen more as distractors from the overstuffed nature of the album rather than any rectifying factor, the fact that Starset have included the biggest, most bold tracks they can here is enough repentance. At its core, Vessels is a true hard rock record, especially in the lyrics which thematically don’t stray too far from the genre’s usual territory, particularly in terms of massive arena ballads, albeit ones peppered with references to science and technology (“Something blocking our reception / It’s destroying our connection” in Frequency, “Galaxies ignite / I’ll think of you each time they wash me in their light” in Starlight and so on). 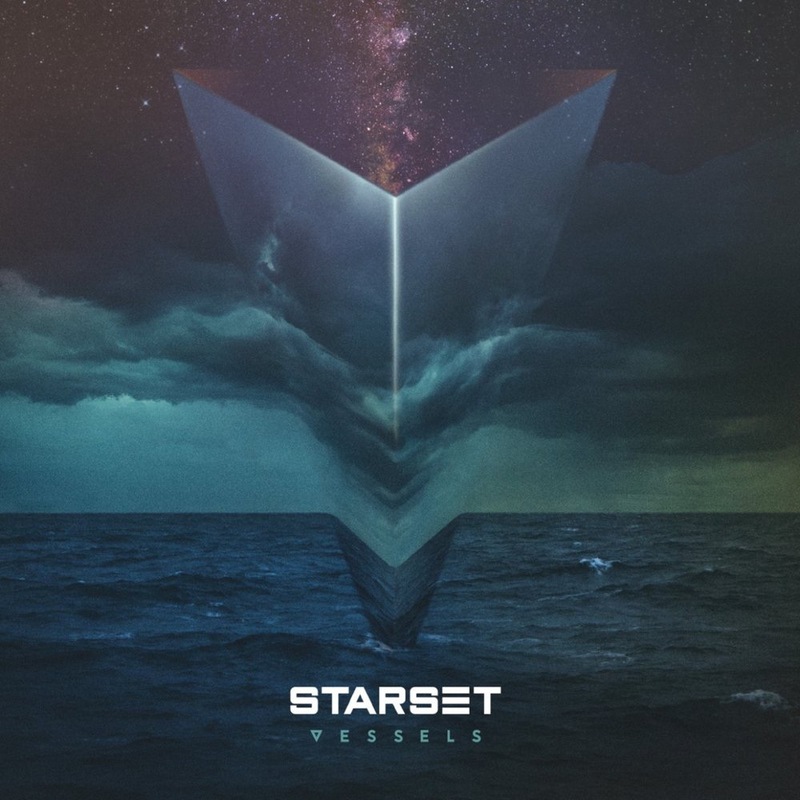 But Starset really don’t need to do anymore than that; the populist streak on this album is huge, especially in Bates’ widescreen choruses that really fly thanks to the more cinematic instrumentation. The vocal manipulation is obvious, particularly on the album’s quieter moments, but there are clear signs of that being the intention, capturing the coldness and artificiality of a space station, and as such, lending moments like the screaming on Into The Unknown or Gravity Of You a good deal more potency. Even with that in mind though, it’d be a lie to say that Vessels is anything close to perfect; there are too many ambitions and ideas thrown in that are left unfulfilled, and the excessive runtime means that not everything sticks, particularly around the middle. But looking past that, Starset at least have a working knowledge of how to make the rapidly stagnating US radio rock sound appealing to the modern day, even though some points can feel like overkill. Looking at both of their albums to date it’s unlikely that they’ll rein themselves in, which is probably the best option in order to eke out some real potential. If not, let’s just hope they can pick up the good formula they have now and turn it into something great. ‘Vessels’ by Starset is released on 20th January on Razor & Tie.